This San Francisco waterfront tour takes you from the Bay Bridge to Pier 39, a distance of about two miles. If that sounds too far for you, don't worry. If you tire out, the F-Line historic trolley runs along your path, and you can get on at any station along the way. Start your walk at or near Pier 24, beneath the Bay Bridge, then walk northwest toward the Ferry Building and Pier 39. The Bay Bridge once suffered in comparison to the Golden Gate Bridge across the Bay, but with the addition of an elegant eastern span and the western span turned into a piece of artwork, all that changed. The evening display called the Bay Lights is an artist's installation of twinkling LEDs that create a nearly hypnotic effect. To find out where to see them from, get all the details in the guide to the Bay Bridge and Bay Lights. Waterfront Dining: You'll find two nice-looking restaurants near the Bay Bridge, tempting for their views and boasting gorgeous interiors by designer Pat Kuleto. Sadly, their cuisine doesn't match up to the scene, and prices are quite high. Go at lunch to enjoy the ambiance and view without going into debt to do it. 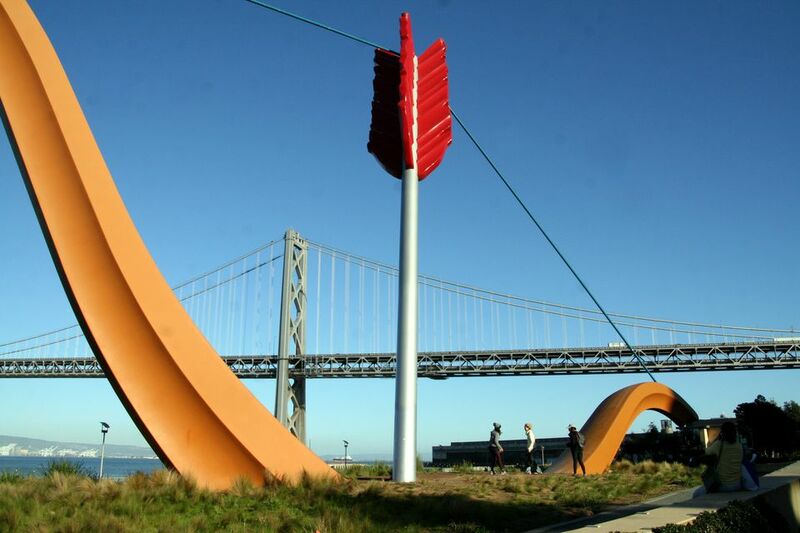 Rincon Park: This small park is home to an outdoor sculpture that looks like a bow and arrow called Cupid's Span. It's located next to the fireboat pier, and when the boats vent their hoses, the arching water spray adds even more to admire. Pier 14: In the early 1900s, hundreds of thousands of ferry passengers traveled past Pier 14 to the nearby Ferry Building every day. Today, the rebuilt version is the best place in town to get a view of the Bay Bridge. Ferry Building: All those ferry passengers from the past are now replaced by shoppers and hungry visitors who come to shop and dine in the artisan food shops and restaurants. The shops are open every day, and on weekends, it's all surrounded by a lively farmer's market. Get all the details in the Ferry Building Guide. Herb Caen Way... The sidewalk between Pier 1 to Pier 42 is named Herb Caen Way... in honor of Herb Caen, the Pulitzer Prize-winning columnist who wrote for the San Francisco Chronicle for more than 50 years. The three dots after the word "Way" are part of the name because of Caen's writing style, which included lots of - you guessed it - ...'s (otherwise knows as ellipses). Historical displays, poems, and quotations are set into the sidewalk, all worth looking down to find and taking a moment to read. The glass blocks set into the walkway are called the Embarcadero Ribbon, tying the wharf-front together with a continuous line of glass block surrounded by a concrete walkway. It Looked Like That??? : If you detour across The Embarcadero at Washington Street, to check out the display showing how the area looked before the 1989 when a towering freeway overshadowed the waterfront area, you'll appreciate today's waterfront even more. The 1989 earthquake damaged the unsightly roadway beyond repair, setting off a chain of events that resulted in the ongoing improvements. Pier 7: This public pier extends 900 feet out into the Bay, edged with Victorian-style light fixtures and benches. It's the second longest fishing pier in San Francisco. If you bring your fishing pole, you might catch starry flounder, sea perch, halibut or striped bass. Or just take your camera and snap an Instagram-worthy photo. The Exploratorium: San Francisco's justifiably-famous, hands-on science museum is located at Pier 15. It's so much fun that you might not even realize you're learning something and in the unlikely event that you get bored, their panoramic San Francisco Bay views are some of the best on the waterfront. It's well worth a stop even if you don't think you like science much. You can find out more about it in the Exploratorium Guide. Pier 27: This pier houses San Francisco's cruise ship terminal. Continue to the Golden Gate Bridge: The waterfront continues past Pier 27, and it's possible to walk all the way from there to the Golden Gate Bridge. Continue your walk using the guide to Pier 39, then go on from there to Fisherman's Wharf to Ghirardelli Square. Past Aquatic Park, follow the waterfront path past Fort Mason and end your trek to the Golden Gate Bridge by taking the scenic walk along Crissy Field. If you make it all the way to Fort Point from the Ferry Building, congratulations. You will have walked more than five miles.